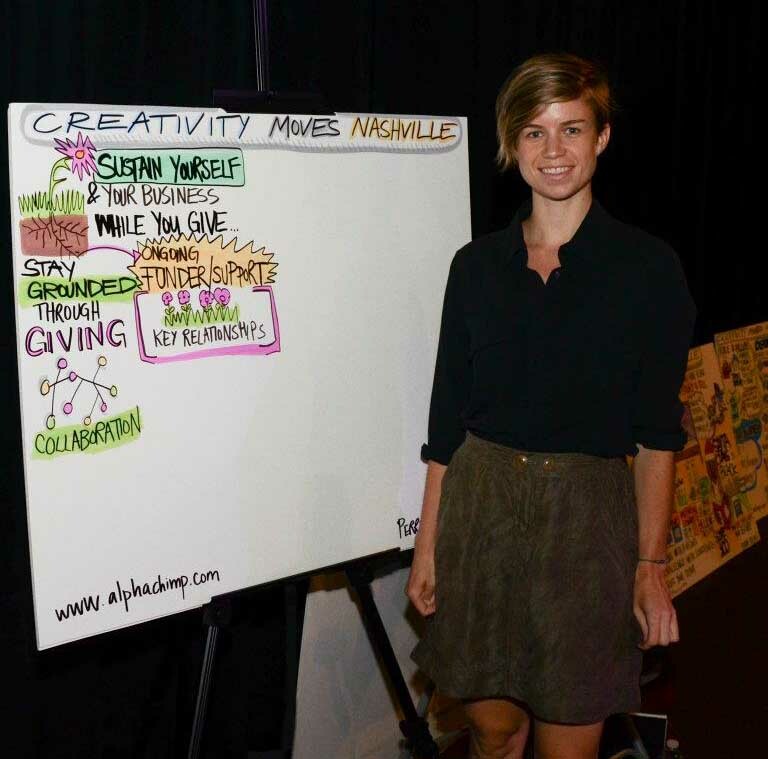 Held at Belmont’s Black Box Theater, Weiss opened the event juggling, setting the stage for a variety of creative, out-of-the-box, totally inspiring Nashville doers to share their models for staying engaged and giving back. Graphic capture of presentations by Jacob Weiss, Sam Davidson, Jason Michaels, and Lu SiposTo name just a few of the great presenters: We heard from Lu Sipos, a mother of a toddler with cancer who created a comforting toy for child cancer patients, called Chemo Duck, and grew a non-profit out of it. Jason Michaels, a world-famous illusionist, shared about discovering the remedy for his Tourette’s Syndrome the first time he stepped on stage at age fourteen. 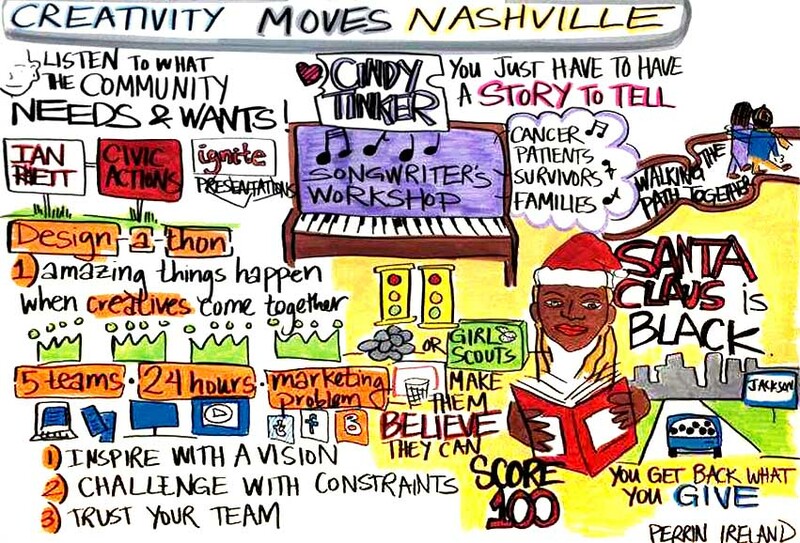 Cindy Tinker co-organized of a song-writer’s workshop for cancer patients. Ian Rhett, founder of the Design-A-Thon, gave an Ignite presentation about the event, which gathers designers in an enclosed space for a design challenge: solve a local non-profit’s marketing problem within 24 hours. Ian Rhett, Cindy Tinker, and Gemma HolmesWeiss took center stage once more to deliver the afternoon’s keynote address, “Creativity, Causes, & Careers”, a potpourri of strategies for growing one’s brand as an artist by being relevant to the community through partnerships, one to one connection, sincere passion, and, most of all, listening to the needs of the community, and helping to meet them. He encouraged artists to not only seek to serve a cause, but also to discover how the cause could serve the creative. When so often it seems we must be out for ourselves entirely as artists in order to eke out a living, Weiss’s perspective on serving others first through the power of creative storytelling was a very refreshing call to action. 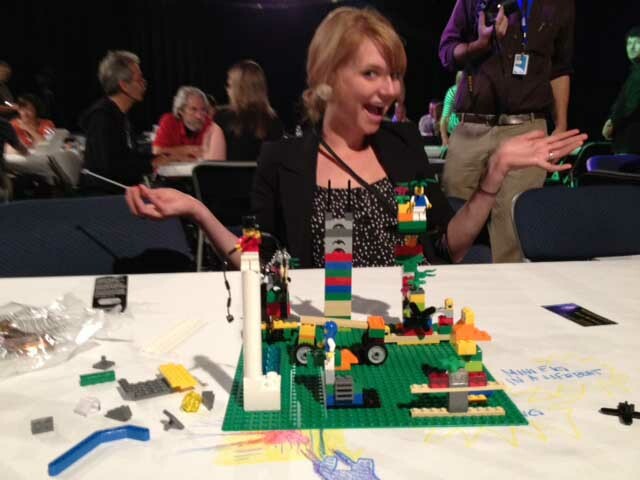 A participant enjoys Lego Nashville Closing out the afternoon was Jody Lentz, who ran the participants through a hands-on Lego workshop, facilitating as attendees broke into groups and explored, in three-dimensions, how creatives and non-profits can best collaborate in Nashville. Perrin Ireland at the easel; Credit: Matthew Freise, Nossi Alphachimp loves the opportunity to learn about amazing people creatively contributing to community- we were very honored to be included in this event, and look forward to more of its kind! To see more of Matthew Freise's fabulous photographs of the event, check out his Facebook album.